Using SSH keys for authentication when connecting to your server, or even between your servers, can greatly simplify and increase the security of your login process. When implemented correctly they provide a secure, fast, and easy way of accessing your cloud server. 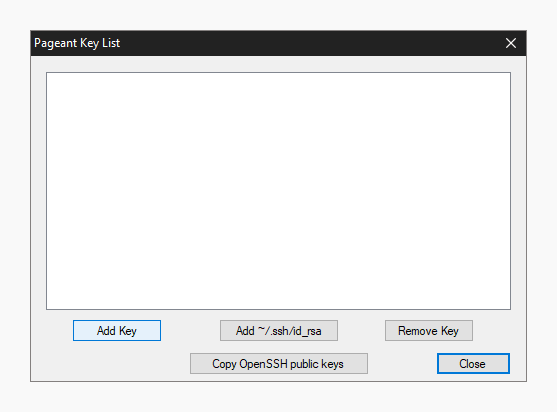 Follow along to learn how to set up your first SSH keys using OpenSSH or PuTTYTray. To add an SSH key pair, first, create a hidden folder to your user account home directory on your cloud server with the following command. Then restrict the permissions to that directory to just yourself with the command below. This creates a secure location for you to save your authentication keys. However, note that since the keys are stored in your user home directory, every user that wishes to connect using SSH keys has to repeat these steps on their own profile. Now continue on your own computer if you are using Linux or any other OS that has OpenSSH. PuTTY users should skip to the next section. 1. Generate a new key pair in a terminal with the next command. The key generator will ask for location and file name to which the key is saved to. Enter a new name or use the default by pressing enter. 2. (Optional) Create a passphrase for the key when prompted. This is a simple password that will protect your private key should someone be able to get their hands on it. Enter the password you wish or continue without a password by pressing enter twice. Note that some automation tools might not be able to unlock passphrase-protected private keys. 3. Copy the public half of the key pair to your cloud server using the following command. Replace the user and server with your username and the server address you wish to use the key authentication on. This also assumes you saved the key pair using the default file name and location. If not, just replace the key path ~/.ssh/id_rsa.pub above with your own key name. Enter your user account password for that SSH server when prompted. You can now authenticate to your server using the key pair, but at the moment you would need to enter the passphrase every time you connect. 4. (Optional) Set up an SSH-Agent to store the keys to avoid having to re-enter passphrase at every login. Enter the following commands to start the agent and add the private key. Type in your key’s current passphrase when asked. If you saved the private key somewhere other than the default location and name, you’ll have to specify it when adding the key. Afterwards, you can connect to your cloud server using the SSH keys for authentication, and only having to unlock the key by repeating the last 2 steps once after every computer restart. If you are running Windows and PuTTYTray for SSH, you can use the built-in key generator from PuTTY to create a new key pair. 1. Click the Keygen button at the bottom of the PuTTY Configuration window to get started. Then in the Key Generator window, check that the Type of key to generate at the bottom is set to SSH-2 RSA. The older SSH-1 was the first version on the standard but is now generally considered obsolete. Most modern servers and clients support SSH-2. 2. Click the Generate button to begin. 3. Keep moving your mouse over the blank area in any manner to help generate randomness for a few moments until the progress is complete. With the keys finished, PuTTY will show the relative information about the pair along with the public key for easier copying. 4. (Optional) Enter a key passphrase in the 2 empty fields for the added security before continuing. The passphrase will protect your key from unauthorized use should someone be able to copy it. However, some automation tools might not be able to unlock passphrase-protected private keys. 5. Click the Save private key button and store it somewhere safe. Generally anywhere in your user directory is fine as long as your PC is password protected. Before closing the keygen, you may want to copy the public key to your clipboard, but you can always get it later as well. Now that you have a new key saved on your computer, you’ll need to import it into the PuTTY key agent. 6. Click the Agent button to open the key manager in the PuTTY Configuration window. 7. Click Add Key button in the Key List, then browse to the location you saved the private key, select it and click Open. Enter your key passphrase if asked. This will import the key to your PuTTY client, but you still need to copy the public key over to your server. 8. Open an SSH connection to your cloud server and go to the SSH key directory. 9. Open or create the default file OpenSSH looks for public keys called authorized_keys. 10. Paste the public key into the file by simply right-clicking the SSH client window. Make sure the key goes on a single line for OpenSSH to be able to read it. When you’ve copied the public key over to the authorized keys list, save the file and exit the editor. You can now test the public key authentication by logging in to your server again. You should not get asked for your password, but instead logged straight in with the key. If it’s not working, check that your private key is unlocked at your SSH Agent and try again. With SSH key authentication configured and tested, you can disable password authentication for SSH all together to prevent brute-forcing. When logged in to your cloud server. 1. Open the SSH configuration file with the following command. 2. Set the password authentication to no to disable clear text passwords. 3. Check that public key authentication is enabled, just to be safe and not get locked out from your server. If you do find yourself unable to log in with SSH, you can always use the Web terminal at your UpCloud control panel. Then save and exit the editor. 4. Restart the SSH service to apply the changes by using the command below. With that done your cloud server is now another step along towards security. Malicious attempts to connect to your server will results in authentication rejection, as plain passwords are not allowed, and brute-forcing an RSA key is practically impossible. Remember to always keep your private keys safe. You can use the same key from multiple computers if you wish, or generate new ones on each client connecting to your cloud server for added security. Each user should generate their own key pair and passphrase for secure access control. With proper management, even in case one of the private keys gets compromised you won’t have to replace them all. Already setup ssh keys on server and running well. But now my local computer is dead and maybe motherboard is dead and cannot connect to server as private keys were saved in computer. Now lost private keys with computer and cannot connect to server. How to fix this problem? Pls send detailed answers how to connect again to server.